Address: 5 Ko Tong Road, Pak Tam Road, SAI HUNG, N. T., Hong Kong. Name of your sending organization: Silk Road Ministries International. Name of the states or countries where you have served: Hong Kong. Other Asian countries, include: Mainland China, Vietnam, Nepal, Philippines, Cambodia, India, & Burma; in our advancing years Hong Kong, Cambodia, & Burma are the countries where we now concentrate our ministries, serving alongside national co-workers. Year Calvary Bible Church began their support to you: 1965, following Billy’s Missionary Internship assignment (1964-1965), and the beginning of his overseas missionary service with OMS International. Focus of your missionary activities (church planting, translation, medical or other): Evangelism/church planting, teaching, special projects, leadership training. 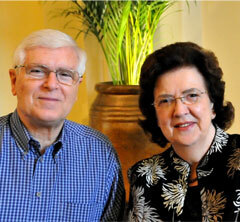 Missionary family, include all family members serving with you: Just Jeanne and Billy serve in Asia. Their two daughters are married - one in USA, and one in London, UK. Activities in which your family members participate: Both daughters are married (see above). Your home church or sending church: Billy’s home, family church is First Presbyterian Church (Evangelical), N. Ireland. Jeanne’s home church is in Carmarthen, S. Wales, UK.